Moya McKenna's Wild Beast (Neon Parc, Melbourne) | Daily Review: Film, stage and music reviews, interviews and more. Derived from a single image of a lion devouring a zebra, Moya McKenna’s suite of six paintings is an exploration of struggle and evocations of fierce, troubled states. As any analyst would say, the artist is both lion and zebra. The work drinks deep from the well of art culture. One might point to the teeth – not lion or zebra – but human teeth. They recall Francis Bacon’s open mouths, which recalls Einsenstein’s Odessa victim. The bloody ribs also point to Bacon, whose paintings of carcasses nod to Soutine’s en route to Rembrandt’s carcass of an ox. The tooth-headed creature pings both Bacon and H.R. Giger’s Alien monster. Bacon echo number four is the palette, with its un-English oranges and reds, but the sap green leads to Howard Hodgkin’s post-colonial absorption of Indian miniatures and his brilliant riffs on hot, tropic colours. Painterliness is a McKenna virtue, and her delight in scrubbing thin paint next to thick, lush passages leads us back through contemporary to School of Paris modernism. Right now, I am put in mind of Amy Sillman’s abstractions, Dana Schutz’s murky narratives and the abstract-figurative Brenda Goodman – three excellent painterly painters working at peak creativity, and masters of oblique subject matter that prompt subjective responses. This mention is only to place and frame McKenna’s work, which strikes me as being easily as rich and sophisticated as that of her US contemporaries. In short, this is a very good show and Moya McKenna is a wonderful painter. Main image: Eater by Moya McKenna, 2019. Second image: A different melody by Moya McKenna, 2019. 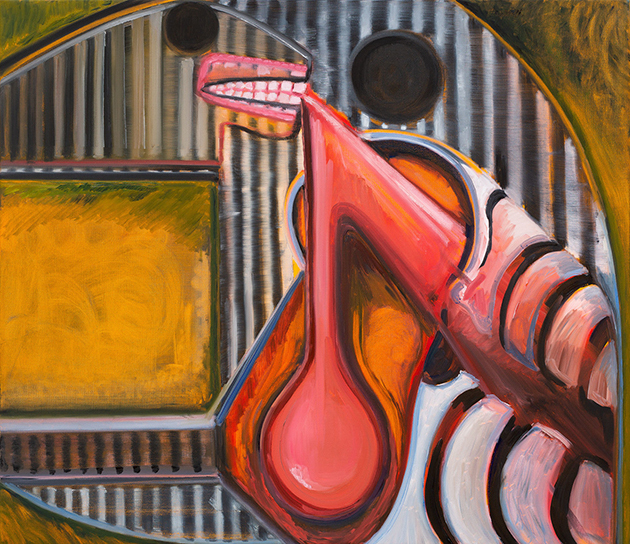 Moya McKenna’s A zebra returns is at Neon Parc, 1/53 Bourke Street, Melbourne, until April 13.